Two visits, early evening and the following lunchtime, preferred lunchtime as it was quieter. Stuck with the Castle Rock Harvest Pale. She who must be obeyed occasionally was impressed with the range of ciders and tried one from Hawkes. Friendly staff had time to chat at lunchtime - mainly to say hello to a little white dog. After a visit to the excellent Beer HeadZ at the station (not listed on here), our third stop in Nottingham was this warehouse-style pub. It is a large barnlike pub that is slightly unusual in that the canal runs into it and there are a couple of canal barges moored inside. 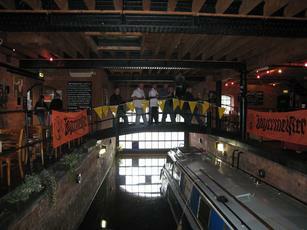 You get to the bar by crossing a bridge over the canal. 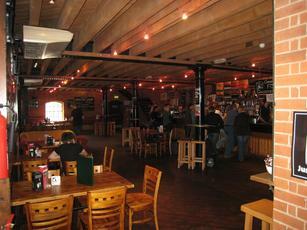 Beers, both cask and keg are displayed on screens behind the long bar. Despite the large interior, there is a focus on upright drinking, with strategically placed barrels on which you can place your drinks. 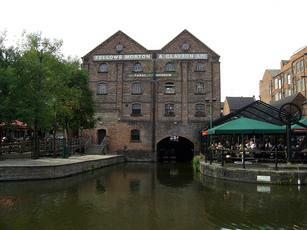 There is also plenty of outdoor seating next to the canal. Ales on were Castle Rock Harvest Pale, Hemlock Bitter, Helen Watts & IPA V1, Nene Valley John Lennon & Titanic Cappuccino Stout. Ciders were Abrahall's AD, Friel's Cider, Once Upon A Tree Crooked Branch, Seacider Blood Orange, Gladstone 101, Barbourne Sweet Kernel, Thirsty Farmer Blackcurrant Cider & Hawke's Urban Orchard Berry Cider. There were plenty of bar staff. So service was efficient. 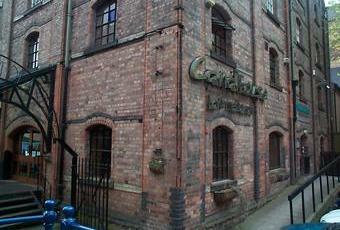 Probably my favourite pub on this visit to Nottingham, which has a great selection of pubs. 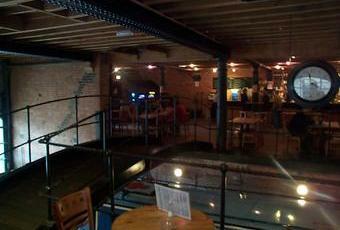 Had 2 good pints sitting next to the canal after the Forest Norwich match. 1 Pint of Lacons and 1 pint of Oakham. I can't comment on the prices as I didn't go to the bar. I enjoyed my visit and would certainly return. Two visits here this week. Wednesday night they had some good beers on, but i thought Thursday's offering were not as good. Also had a lot of craft ales on at crazy prices. Up to £8.00 a pint. even more expensive if you had multiple 1/3, 1/2, or 2/3 measures. What a great pub! Really welcoming and good beer from Castle Rock Brewery. Unusual building with a canal running through it. Food is excellent and decently priced. Tried the venison burger at just £8.95, really good!